The Skills Patrol area is part of Scoutpost and is an area for the first-year Scout. Experienced staff form participants into patrols and work with them on their essential Scouting skills such as knots, lashings, cooking, first aid, and citizenship. The staff is here to not only help Scouts with advancement but also to make sure that the Scouts don't just "pass off" requirments and know how Scouting is done. Each session is run like a troop meeting with an opening, skills instruction, and activities. 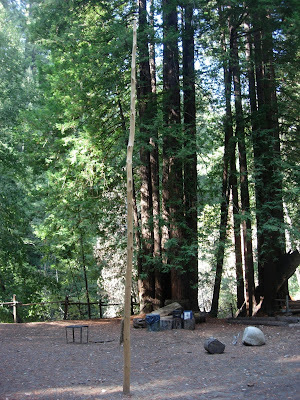 This photo is of a flagpole built by members of the 2007 Scoutpost staff so that new Scouts can practice flag ceremonies and learn about citizenship. This first year program, which is now a mandatory standard for the accredidation of a Scout camp, began in the 1980s here at Pico Blanco.